One of Andalusia’s most historic hotels, the five-star grand luxe Hacienda Benazuza elBulli Hotel is a reformed X century alquería, or fortified manor farmhouse, located 23 km from central Seville in the hilltop town of Sanlúcar la Mayor. 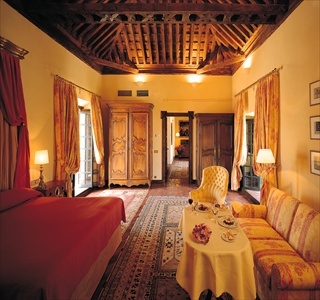 Rich colours, antique furniture and works of art fill the public areas, 44 rooms and suites, complementing the Benazuza’s Moorish-Andalusian neorustic architecture. Private XVII century chapel, dreamy gardens and pool, La Alquería 2* Michelin restaurant and heliport. Ideal for foodies, couples, weddings and high-end business events. Foodies, romantic getaways, couples, one-night experience, receptions, weddings, conferences, business events and product launches, photoshoots. 24 hr. reception, concierge, express check-in/check-out, central safety deposit at reception for larger articles, cloakroom service; languages spoken Spanish, English, French and German. Gardens, library/reading room. Preferred daily national/international newspapers delivered to room gratis. Souvenirs and books in display cabinets for sale through reception. WiFi connection available throughout hotel, except for some areas in the garden. Internet use gratis when using personal PC; connection via room TV charged at 15 euros + 7%/24 hrs. A/C and heating in all public areas. Daily 24-hr. laundry and dry-cleaning service with next-day return, daily 24-hr. on-the-spot pressing service, shoe-cleaning service via housekeeping; babysitting on request. Florist service on request. Doctor on call 24 hrs. Hotel open 17th March 2010 to mid-November. Automatic upgrade to a superior room category (depending on availability) without charge. Complimentary mineral water in your room on arrival. The Hacienda Benazuza elBulli Hotel has 44 individually-decorated rooms and suites on two floors with pretty views to the gardens or patios. All rooms and suites have individual air conditioning/heating, two direct-dial telephones, satellite and cable plasma TV with pay-per-view films, internet access, minibar, in-room safety deposit box, blackout curtains and at least one window that opens. The bathrooms have baths with showers over, bidets and personalised toilet articles in the rooms/Gilchrist and Soames products in the suites. Dressing-gowns, slippers and hairdryers for the use of clients during their stay. Evening turndown service. Newspapers available. Courtesy gift in the room daily. Some communicating suites; smoking/non-smoking rooms. High season: Holy Week end of March and Feria de Sevilla mid April; min stay 3 nights. Cot: 20 euros + VAT per night. Child 2-12 sleeping in existing bed in adults´ room, no extra charge for accommodation. Child 2-12 sleeping in extra bed in adults´ room: 50% of tariff for extra bed, or 35 euros + VAT per night. Extra bed in room: 70 euros + VAT per night. Max cots/extra beds permitted: 1, except in Royal, Presidential and Nuptial Suites, 1 cot + 1 extra bed. Breakfast is not included in the room rate: 36 euros + VAT per person per night. Reservations may be cancelled without charge up to 16 days before the date of arrival. Cancellations made between 15 and 8 days of arrival will be charged at 100% of the first night´s stay. Cancellations made within 7 days of arrival and no-shows will be charged at 100% of the total reservation. Cancellations must be made in writing by fax or email. Special cancellation conditions apply during Holy Week and the Feria de Sevilla. 2* Michelin restaurant under the direction of famous Catalan chef Ferran Adrià and his executive chef, Rafa Zafra. Adrià´s cuisine incorporates an interesting and unique combination of different flavours and textures, and La Alquería´s generous tasting menu features trademark dishes from his main restaurant, El Bulli. Wine recommendation. Gourmet breakfast 08:00-11:00 voted best hotel breakfast in the world by Gourmetour 2005. Closed for lunch. Dinner 20:30-22:45. Vegetarian dishes on request; no children´s menu. Air conditioning. Open mid March to mid-November, closed every Sunday and Monday. Dress code: smart casual. LA ALBERCA: Open-air restaurant by the pool. Mediterranean and Andalusian cuisine with the original touch of chef Rafa Zafra. Vegetarian and children´s dishes on request. Open daily for lunch only 13:00-15:00, from mid March to mid-November. Dress code: casual. LA ABACERIA: Sevillian-style tapas restaurant and bar serving the best local dishes. Open daily for tapas and lunchtime drinks from 13:00-16:00, and for a light supper 20:30-23:00; from mid March to mid-November 2010. Breakfast is not served. Dress code: casual. EL GUADARNES: Great place for an aperitivo followed by a snack, or for after-dinner drinks by the bar or outdoors in the Jardín Francés. Open daily 13:00-02:00, from mid March to mid-November 2010. EL SUR: Open-air jaima, or Moroccan marquee, by the pool, ideal for unwinding in the long summer evenings. Open for after-dinner drinks only in the summer months. 24 hr service, reduced menu served between 24:00 and 08:00. Children´s menu available, vegetarian dishes on request. Room service breakfast is continental only, no other breakfast menu available. The gourmet breakfast served in the restaurant is highly recommended. BUSINESS CENTRE FACILITIES: The following equipment and services are available in the Business Centre: AppleMac and Pentium PCs, WiFi/ADSL internet connection, photocopier, scanner, colour printer, fax, mobile phones, plasma screen TV, videoconferencing, secretarial and translation services. Max capacity 10 persons. WEDDING RECEPTIONS and civil ceremonies may be celebrated in the hotel’s beautiful grounds. Catering for up to 300 seated guests; use of the gardens and patios for photographic sessions; private limousine service, florist, photographer, nuptial suite, personal maid service, hairdresser, personal event planning. PHOTOSHOOTS: A sought-after venue, the historic Moorish-Andalusian style of the hotel and gardens are ideal for photoshoots, fashion shows and film sets. 4 FUNCTION ROOMS of different sizes for conferences, business meetings, product launches, exhibitions and presentations; gala dinners, private dining, receptions and weddings. Organisation of live music and entertainment, corporate gifts, photography, flowers. Personal event coordinator, hostess service and security. Hi-tech audiovisual facilities: projection screens, LCD projectors, microphone system, technical and IT assistance, simultaneous translation service. Hostess service and security. ALMENAS: 440m2 banqueting room on two floors; the second floor is a balcony overlooking the first. 10 m ceiling with wooden beams. Max 300 seated, 500 for a reception, 200 theatre style. Access to open-air Patio de las Almenas. MOLINO: 48 m2 small meeting room, 8 m ceiling. Max 30 persons seated. Access to Patio de la Higuera for coffee-breaks or aperitivos. BELMONTE: 45 m2 small meeting room, 4 m ceiling. Max 18 persons seated. Access to both Patio de las Palmeras and Porche Belmonte for coffee-breaks or aperitivos. GAMARRA: 45 m2 library with hunting trophies, 4 m ceiling. Max 15 persons seated. Direct access available through Patio de las Palmeras. Outside pool, open during the warmer months from beginning April to end October, weather permitting. Unheated in the warm Andalusian climate. Exotic Moorish-Andalusian gardens of 2,000 m2 with palm trees, orange trees, spice trees and fruit trees dotted with romantic, filmy-curtained day-beds. Lunch can be served by the pool 13:00-15:00, menu as Alberca Restaurant. Tennis and paddle courts; petanque (boules). Shooting on nearby private estate of 3.000 hectares can be arranged. SENSORIA: Exclusive 120 m2 spa suite designed for the private use of one or two persons: sauna, steam bath, jacuzzi, ice fountain, fireplace. Menu of massages and body treatments from 110 euros + VAT. Open daily 10:00-20:00 by appointment only. Hairdressing service on request in client´s room. No smoking in non-smoking clients´ rooms, La Alquería and La Abacería Restaurants, the function rooms, reception and spa. Smoking is permitted in smoking clients´ rooms, La Alberca open-air restaurant, Bar Al Sur and Bar Guadarnes, the pool and the gardens. La Alquería: smart casual. In the rest of the hotel: casual. Dogs up to 10 kgs are accepted, on condition their owners reserve a garden room. The Hacienda Benazuza elBulli Hotel is surrounded by 40 acres of olive groves and farmland on the outskirts of the country town of Sanlúcar la Mayor, overlooking the valley of the river Guadiamar. The hotel is 23 km from Seville, 10 km from the nearest golf course, 50 km from the Atlantic beaches and 5 km from the forest. 24-hr private chauffeur-driven limousine service. Heliport in the hotel grounds. Valet parking service. Free parking in the 24 hr guarded open-air car park. Cars, motorbikes and mountain bikes may be rented through the hotel. Aeropuerto San Pablo, Sevilla: 36 km/33 min. Santa Justa train station, Seville: 31 km/28 min. Guided cultural/shopping visits to Seville, Jerez, Cordoba and Granada. Panoramic cruise on the River Guadalquivir. Visits to the Doñana Nature Reserve in horse-drawn carriages or 4x4 vehicles; bull-breeding farms; a genuine flamenco show; or to the cellars of Jerez or Sanlúcar de Barrameda for a winetasting. Balloon trips from the hotel´s own helipad. Nearest golf courses: Las Minas (9 holes) 10 min; Zaudín (18 holes) 15 min; Real Club de Golf de Sevilla (18 holes) 20 min. Group activities.